The Curious Wavefunction: Richard Feynman on our difficult times: "Whatever else is going on, we've always got our physics." Richard Feynman on our difficult times: "Whatever else is going on, we've always got our physics." At this unfortunate moment, one of the best things I can think of is an anecdote about Richard Feynman from Stephen Wolfram's new book "Idea Makers". Wolfram was a graduate student with Feynman, and he recounts an episode from one of his visits to Feynman's place. "If there's one moment that summarizes Richard Feynman and my relationship with him, perhaps it's this. It was probably 1982. 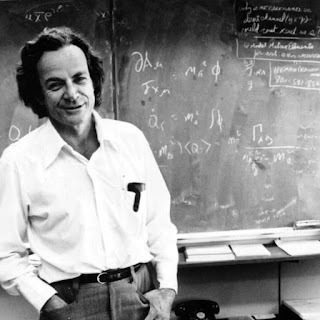 I'd been at Feynman's house, and our conversation had turned to some kind of unpleasant situation that was going on. I was about to leave. And Feynman stopped me and said, "You know, you and I are very lucky. Because whatever else is going on, we've always got our physics." To which I may add, we also have friends, family and our hobbies. Whichever direction the maelstrom of political winds blows our ship, we may take solace in these relative constants of our life. It does not mean that we lose ourselves in them to the extent of completely withdrawing from the larger national dialogue - the next few years more than any others demand our participation in that dialogue - but it's very reassuring to know that a carbon-carbon bond, or a supernova, or a protein molecule, or a semiconductor, or an equation, simply don't care who the president of the United States is. Moreover, as Einstein once said, time itself is no more than a "stubbornly persistent illusion", and if time might be illusory, then politics is a vanishingly transient ghost in the grand scheme of things. I find cool succor in this pristine, untouched domain of science and ideas, and I hope most of us will in the difficult days ahead. Great point by Richard Feynman but my take is different. Yes we can always my take is different and is very poignantly expressed on a blog site I read somewhere and that is You throw a stone and skim it across the water. As soon as the stone touches the surface of the water, a ripple forms that becomes larger and larger. The ripple effect is so much greater than the original impact formed by the single stone. The water ripples that surround your stone demonstrate the effects of times we are living on! Anyway, I will go back to my organic chemistry and maintain my sanity! Well, whiny Feynman and Wolfram accomplished a lot. It amazes me that a great many in the scientific community, more so in the Boston area where I went to grad school and have worked for many years, assume that if you are a scientist you must also be a loony progressive. Actually, the number of scientists who are either conservatives or, like myself, classical liberals is significant, but since we want to keep our jobs we tend to be silent. And in as much as the president-elect may not have been our first (or second or third...) choice, he is preferable than his evil totalitarian criminal opponent. I don't think all scientists are loony progressives and a fair number (like myself) are classical liberals. But even as a classical liberal and conservative you couldn't support this guy; all three adjectives you applied to his opponent could easily apply to him too. In any case, we'll see. Fortunately this country is bigger than any one person and the future is unpredictable (just like it was even a week ago).